The Ionic column is typically identified by its capital, which includes large paired spiral scrolls, or volutes. It has the tallest base of the three classic Greek orders. 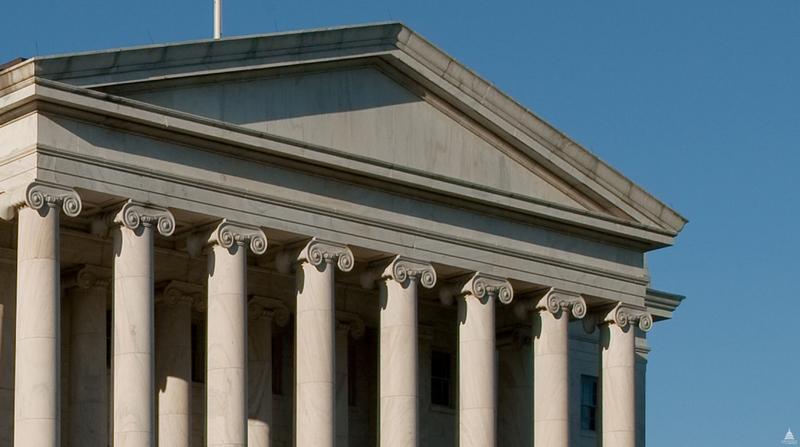 Columns in this style can be found throughout Capitol Hill, including the U.S. Capitol, the Supreme Court Building and the exterior of the Longworth House Office Building. The Old Senate Chamber, located in the U.S. Capitol Building, is a two-story room modeled after the amphitheaters of antiquity. Eight Ionic columns of variegated marble quarried along the Potomac River support the Chamber’s gallery on the east wall; they were inspired by the columns of the Erechtheion in Athens. The Supreme Court Building’s grand Court Chamber is a dignified room lighted by side windows behind screens of Ionic columns. The 24 columns are made of Old Convent Quarry Siena marble from Liguria, Italy. The Longworth House Office Building is one of Washington’s best examples of the Neo-Classical Revival architecture. Its exterior features Ionic columns that support a well-proportioned entablature and are used for the building's five porticoes, the principal one of which is topped by a pediment.